[Mombasa] Following the Indian Ocean Tsunami of December 26, 2004, a young hippopotamus in Kenya was separated from his herd and washed out to a coral reef some distance from the ocean shore. Standing alone, he was forced to fend for himself on the reef until local villagers used fishing nets to help catch and transport him to safety. Concerned that introduction to a new herd would cause him to be killed by its dominant male, the villagers decided to relocate the baby hippo they now called “Owen” to an animal sanctuary. 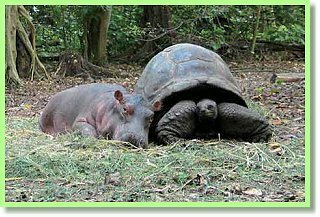 Perhaps because Owen was looking for the closest match to his huge gray mother, or perhaps because he sensed the love of the tortoise whose name means “wise elder” in Swahili, the hippo quickly singled out 130-year-old Mzee. 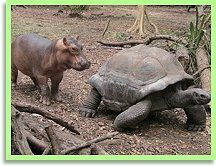 As soon as Owen saw the tortoise, he charged to Mzee’s side. At first Mzee ignored his young admirer, but ultimately he was unable to resist Owen’s enthusiastic pursuit and the pair became inseparable. A year later, this odd couple still sleeps side by side every night (see photo). Owen has even adopted the tortoise’s preference for eating vegetables instead of the hippo’s usual fare of grass. These two enjoy each others’ company immensely, often frolicking in the pond like children and going for walks together. Moreover, the two friends have been observed communicating in a new language. Neither of them utters sounds typical of their species, but instead they emit high-pitched notes to each other in a code that experts have not yet figured out.